on 4/24/1920 in Lee County Kentucky. A connection to Owsley County has not been established. Pvt. Co. I 152nd Inf. Buried Lucy Angel Cem., Perry Co.
Pvt. Co H 7th Inf. Buried in Henry Gabbard Cem., Essau, Owsley Co.
PVT 7th Inf. 3rd Div. Buried William T. Becknell Cem., Bowman Fork, Sturgeon, Owsley Co. Buried Cortland Cem., Indian Creek, Owsley Co.
Pvt 149th Inf. Reg. 38th Inf. Div. Buried Kash Brandenburg Cem., Booneville, Owsley Co. Buried Griffith Cem., Owsley Co. Buried Bowman Cem., Hwy 30 E, Booneville, Owsley Co. Buried Gabbard Cem., Ricetown, Owsley Co. Buried Combs-Campbell Cem., Scoville, Owsley Co. Buried Murrell Cem., Owsley Co.
Orlie C. Combs Incorrectly listed as Arlie C. Combs on monument. 2nd Lt. US Army 133rd Inf. Reg., 34th Inf. Div. Buried Kash Brandenburg Cem., Owsley Co. Buried Family Cem., Lucky Fork, Owsley Co.
SGT. 847th Bomber Sq., 489th Bomber Grp. Buried Turner-Bowman Cem., Owsley Co. Buried Holcomb Cem. (next to Pendergrass Cem. ), Levi, Owsley Co.
Woodard Johnson Woodrow “Woody” Johnson the s/o Clifton & Sophia Johnson. Buried Henry Gabbard Cem, Essau, Owsley Co.
PFC 179th QM Bakery Co. Buried Strong Cem., Big Springs Rd, Green Hall, Owsley Co. Buried in Winchester, Clark Co., KY. Buried Scott-Clark Cem, Big Springs Rd., Green Hall, Owsley Co. Buried Dean Cem., Lerose, Owsley Co. Buried Lerose Cem., Owsley Co. Connection to Owsley County has not been established. Pike Co., KY census s/o Edward & Gladys Wagoner. NOTE: Rand McNally lists a community named Owsley in Pike Co., KY. Buried Henry Gabbard Cem., Essau, Owsley Co. Buried Nick Moore Cem., Lerose, Owsley Co. Buried Rowland-Bowman Cem. near Endee, Owsley Co.
PVT 5th Inf. 1st Batt. Buried Pendergrass Cem., Levi, Owsley Co.
Bur. Daniel Mainous Cem. Vincent, Owsley Co. Buried Porter Cem., Vincent, Owsley Co.
PFC 27th Inf 25th Div. Buried Elihue Reynolds Cem., Cow Creek, Owsley Co.
PFC Com 1st Marine Div. PFC US ARMY 25th Inf. Buried Campbell Cem., Booneville, KY. Buried Elmer Evans Cem., Pebworth, Owsley Co.
SGT Co. C 11th Inf 5th Div. Buried Cow Creek Presbyterian Church Cem, Owsley Co. Buried Reynold/Treadway Cem., Cow Creek, Owsley Co. Buried Taylor-Shepherd Cem., Left Fork, Island Crk, Owsley Co.
SP 4 US ARMY 25th Inf. 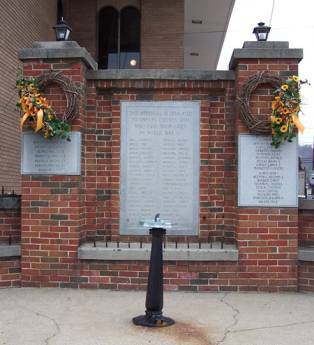 The original names were taken from the memorial at the courthouse in Booneville. Names with an * were submitted by individuals or were located on another source.